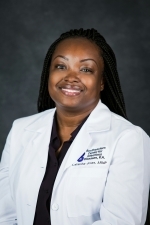 Latarsha graduated from Albany State University in 2015 with a Master of Science-Family Nurse Practitioner. Her scholarly project was "What is Nurses Knowledge of Surgical Site Infection." She went to Nursing School at Thomas University in Thomasville, GA and graduated in 2011. Latarsha joined our office in December 2015. Prior to working with us, she worked at Archbold Memorial Hospital on the orthopedic/neurosurgery/pediatric floor for over twelve (12) years. Six (6) as an RN and five (5) as an RN/Assistant Nurse Manager. Latarsha’s clinical interest include surgical site infections and the role the healthcare staff plays in preventing these types of infections. She is a member of the American Academy of Nurse Practitioners. She has lived in Thomasville her entire life, is married and has one son. Latarsha enjoys reading, spending time with her family and traveling.